Podcasting is not just entertainment. Done correctly it can deliver immense value to a wide audience and be a sustainable source of income. Discover why Podcasting is the sleeping giant of content marketing! 29:12 – What do people really want to know? 31:29 – Where do ideas come from? 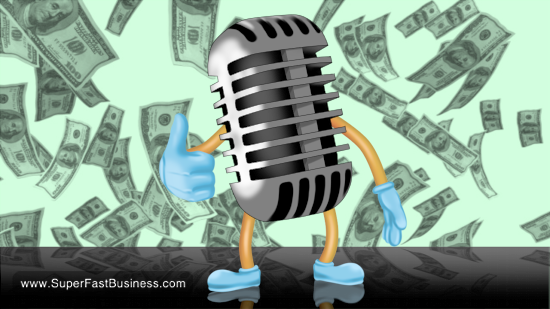 Can you make money podcasting? James: James Schramko here and I’m also here with Ezra Firestone. Good day buddy. Ezra: Ladies and gentlemen… That was my version of hello buddy. James: That was like the best intro you could hope for. It was kind of better than the intro we had at an event that we spoke out recently, it was like this particular presentation live and it was hilarious but what we thought we’d do in the good old nature of the leverage of the Internet is to grab the slide deck and to run through thee slides with a little bit of commentary that we could share with people who are special and dear to our heart so that we could get the message out there. Ezra: And like the funny thing is people say that kind of stuff right? Like people who are special and dear to our heart but I think we are the only dudes who actually mean that. Like we really care about you and your business and how it goes, what’s going on and whether or not you have accurate information, we genuinely care about it. James: Yeah, we don’t actually really have anything to sell except the idea that we want to give value and hopefully this will inspire people to create and to get as much reward out of podcasting as what we have which have been substantial and we’ll cover that in the slides so are you ready for it? Ezra: Let’s roll. I’m sitting on a bouncy ball by the way. James: Wonderful. Thank you for sharing that. Ezra: Yeah, it’s got a little back support. It’s got these little handles like I can bounce around the room. James: Yeah? Well, last time we’re sitting down together before the presentation that we just did recently, we were presenting it at my event and something strange happened at that event, I put it down to this, the cup of tea you’re having for your sore throat or whatever sickness that you were bestowed when you travel, sometimes, you get out of shape, but that led to something unusual. Ezra: Well, I don’t know how unusual it is and why everyone just won’t let this go? That happens. James: It is unusual, I’ve never seen it before? Ezra: You’ve never seen anyone pee before? James: I have but not halfway through the presentation. OK, not halfway..
Ezra: You know sometimes, you just got to do it. It was near the end right? We were almost done. In fact, I even checked with you, hey, are we done? Ezra: Basically, I just had to get up and pee and I had to do that and I even got back and answered the question I haven’t even heard. James: You know, the interesting thing is that, I didn’t think you can top that but I was wrong. The last presentation that we did, you had a confession that you’ve broken some magical, mystical ring that Clay Collins had loaned to you. And we had a stray dog allegedly and a runaway child or the other way around, I’m not sure. Ezra: There was definitely a stray dog… no..
James: It was kind of weird. Ezra: It was very strange. It tends to happen when we get on stage together. So yeah, we’re strange but we also know about this podcasting stuff. James: Yeah, so we’re going to cover why do we podcast and get into that. A big reason is that changes in Google’s search engine algorithm really shook up a lot of website owners in the last three years. There was of course, the big Panda. There was the Penguin which was probably even more severe for most business owners and then now we’ve got Hummingbird. So the real theme here is that Google keeps changing the platform, and it’s not the only place you have to play. You don’t have to be Google-dependent. Now as a search engine optimizer and running a successful business in this space, it’s still very popular and lucrative and worth getting results for. But podcasts will add an extra channel to it. It will get you onto a different platform that is not SEO-dependent. However if you use some of the things we talk about you will pick up SEO as a by-product, and I am talking specifically about the way you set up your website and structure your show notes. Ezra: Well, it’s channel diversification, right? It’s like, ever since I’ve been online, there have been different channels that were very effective to market in – Google and Facebook and Amazon and iTunes. It’s a wide-open channel for people who like to create content and have conversations with communities of people, which is basically anyone who has a business should have – a content marketing arm, should be owning the racecourse, should be communicating with that community of people about more than just the products they’re selling and then making them additional and relevant offers. And podcasting gives you probably the best way to do that. Ezra: Six and a half billion. James: It’s like 93 percent penetration. Ezra: I guess the billion of those have iOs devices. James: A lot of them will have iOs devices. The reality is your iTunes show is probably easier for someone to get access to than a general web-based application, that’s my main point there. So this is what an episode looks like in an iPhone, people can see your show, you have a picture, a description, a topic, they can easily push one button to subscribe and that will pull in every episode you ever published and they can download past episodes. So that’s a pretty cool feature and this is just up in iPhone5 but your show can be on somebody’s iPhone that’s the keypoint and it continually updates with that one press of the button once, very powerful. 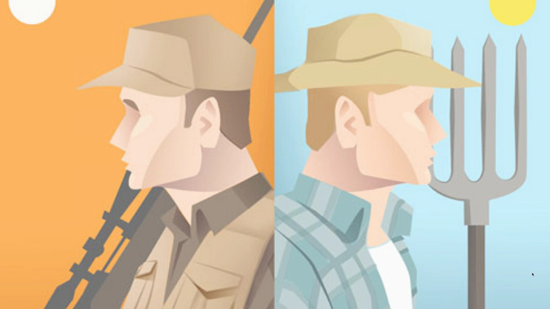 So probably one of the most interesting topics we covered is the hunting versus farming thing. The hunter is the one out there, looking for the next meal, you know, shoot the prey eat it and then it’s gone. But podcasting is probably a lot more like farming where you building and nurturing and tending to the fields, the orchards or the grapevines so that you have a continual harvest. So podcasts pay, you build up an audience, then you can run offers to that audience, you can build and continually grow your audience numbers and you will find that this is a long-term, sustainable traffic machine but it can also be very profitable and we’ll give you some examples of how we made profit. Ezra: It’s one of the best business models from the standpoint of continuing to pay off over time. James: Yeah, it just grows, think of it like an orchard, you can just go out and pick the fruit anytime you want, it’s always there, you don’t have to constantly find the next meal. Ezra: And you can grow cherries, or watermelons or grapes or pears, it depends on what kind of content you want to put out and you know what’s weird with it, you grow things like rambutan, a little bit strange. James: I don’t even know what that is but you can definitely grow it. Ezra: You can grow fungus if you want. James: Why would you want to grow fungus, do people eat that? Ezra: Yeah. Mushrooms are very popular. I’m not talking about fungus on your body dude. Yeah, I’m not talking about toenail fungus. James: ‘Cause I know you have talked about that before. James: OK so when we look at our site stats, a lot of people are coming back and that’s different to the hunting thing. If people are coming back, you’re a farmer. If more than half the people come back, you’re probably farming and it’s a good thing. You’re going to continually have that income and traffic stream. The idea here is you can reach your consumer whenever you want, you just have to publish an episode. 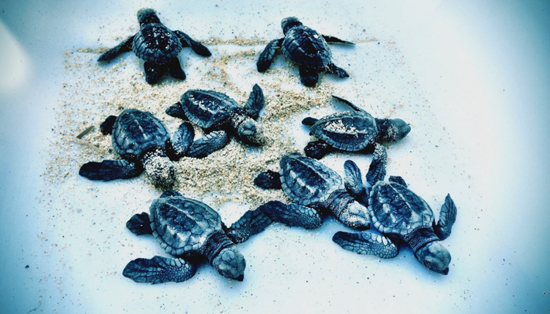 Now think about it like little baby turtles that I saw down here in Cabo, Mexico. These little suckers here they look after them, they put them in a sand pit, they date it, they bring them out with gloves they gently let them crawl back into the ocean and they have a much higher chance of survival. They grow into huge, big, super fat sea turtles, like massive. Like you couldn’t pick it up the size and that’s what we’re doing with our audience, we’re nurturing them like little baby turtles and growing them up into big mature customers. It takes a long time right, this is farming. Ezra: However, it continues to pay dividends year over year. It’s not a one-trick pony you know. It doesn’t fruit one time and then go away. It’s like this thing like our number… well, we’ll get to that. James: Look at you, you know it’s coming. Fancy that. 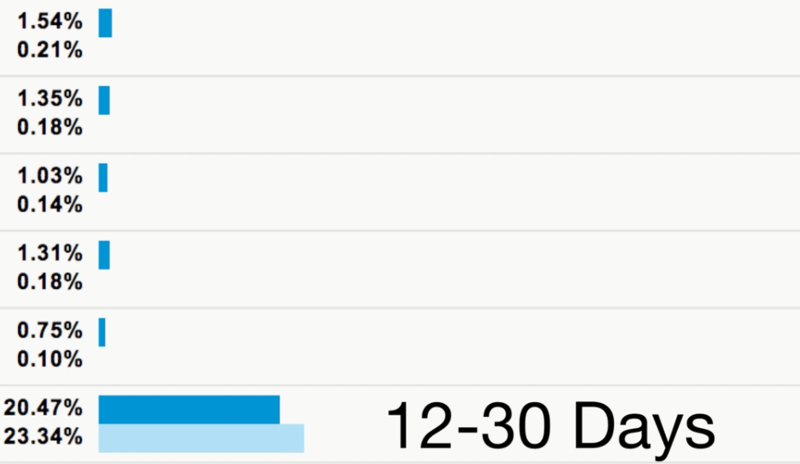 I’m just going to zoom in on a graph but this is how long people visit the site. 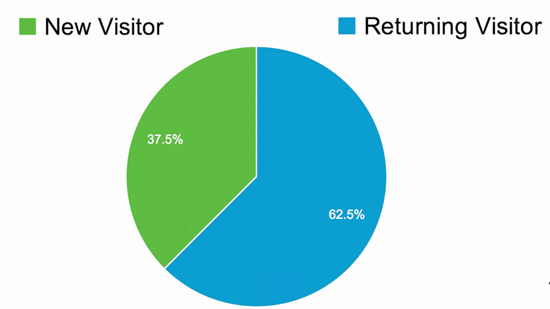 I found that 57.5 percent of people visiting the site will opt-in. Of all the opt-ins, more than half of them opti n the first time because we got some good on-page conversion elements and we’ll share the exact way that we do that. The most interesting thing to me is that 20 percent of my opt-ins opted in in that 12-30 day period. So they’ve come back, they say this is pretty cool and I’m now ready to give you my email address. Thats a fifth of the visitors and that disproves the commonly held belief. you know, that if you don’t get them the first time they’re gone forever. Not so true. Not if you have something useful and less hypey, less pitchy, less pressurized. Ezra: You know, it’s a trend that we’re seeing in marketing. 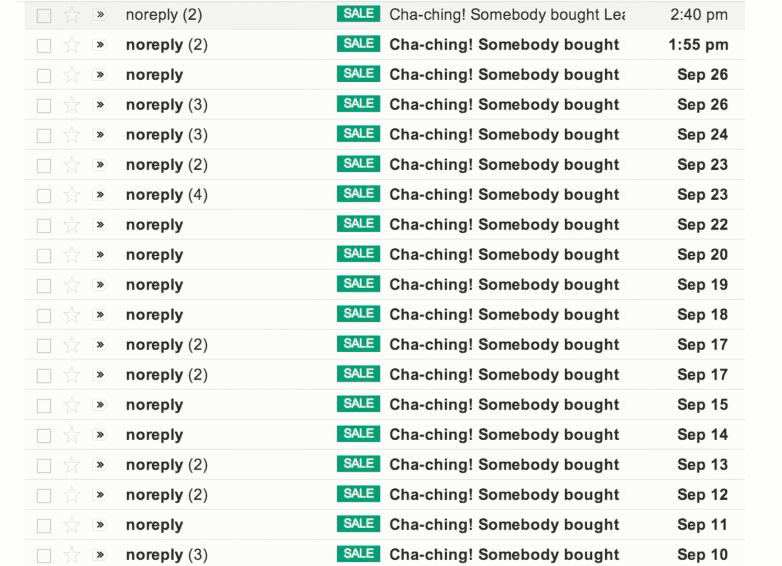 Relationship marketing, people engaging with your content and engaging with you a couple of times before they actually go as far as joining your email list or engaging with one of your product offers, right? Like this is a… you’re missing out on… basically what this displays is if you’re not doing this, you’re missing out on 25 percent of the opportunity. James: Yeah. And also, this thing sells. It sells like crazy. In fact, the reason I got into podcasting was, I was invited to go on someone else’s podcast. And I didn’t know how it really worked. I didn’t know if it was live, or pre-recorded, because they were doing it in a radio studio and I dialled in. So I was on the telephone, they interviewed me, they published the show. This is Tim Reid and Luke Moulton on Small Business Big Marketing. And you can go and look up that old episode. So I talked about my course there, and people bought my course like crazy, and it was enough for Tim to go, “Hello hello hello, I can actually make money from a podcast.” And Tim invited me to join him with a new podcast, and we called that Freedom Ocean. And I got to learn how to set up a podcast, the show format, how to sort of take it up a notch in terms of audio quality. So Tim was kind of like my founding instructor on the podcasting technique, and then I’ve been able to carry that baton along with Ezra and we started our podcast one year ago from when we’re recording this. And now that I’ve got my podcast in tune, I make sales every single day for even just affiliate products, but certainly for my own business. This works for all different businesses – ecommerce, affiliate marketing, service professionals, furniture stores. I did a podcast about stand-up desks and people go and start buying stand-up desks from the store. This thing works. Ezra: You know, it comes back to the fact that the podcast is the medium where you have the highest engagement with the consumer. You build a relationship. Like they’re with you for an hour at a time. You’re in their ears, so you can be a bit more influential over that group of people. High-ticket sales are a great thing to do on podcasts. James: Yeah, and the thing is, you’re building up a show. It’s a show rather than just a podcast. The first one that hit number one was Freedom Ocean. The next one is I actually went and just submitted my Internet Marketing Speed blog to iTunes. Even though I had audios, I wasn’t putting them on iTunes. And I just retrospectively hooked it up to iTunes, and it smashed it into number one. And then SuperFastBusiness was my next one, and then ThinkActGet, our show. That’s four in a row out of the four that I’ve produced. Now I’m running three of those but I’m starting a new podcast this year, and I expect it will hit number one as well. Now the other thing is, I’ve also been able to do this for many clients. There’s so many people in the SuperFastBusiness membership community who have podcasts, and I’ve also got clients who have released them, and all of them have done spectacularly well. In fact, if we have a little look, our first episode from about a year ago, Ezra, has now almost had 8,000 listens. Ezra: It’s our number one podcast episode of all time. And just to give you a sense of the variety, the other episodes that were popular were with Noah Kagan and the startup niche, with Victoria Gibson about Facebook marketing, I had a SilverCircle intensive behind the scenes with Steve O, had SEO information… So varied topics, but all very popular. Now if you were to calculate the cost of getting those cost per clicks with paid traffic, or Facebook ads, then it would actually add up. 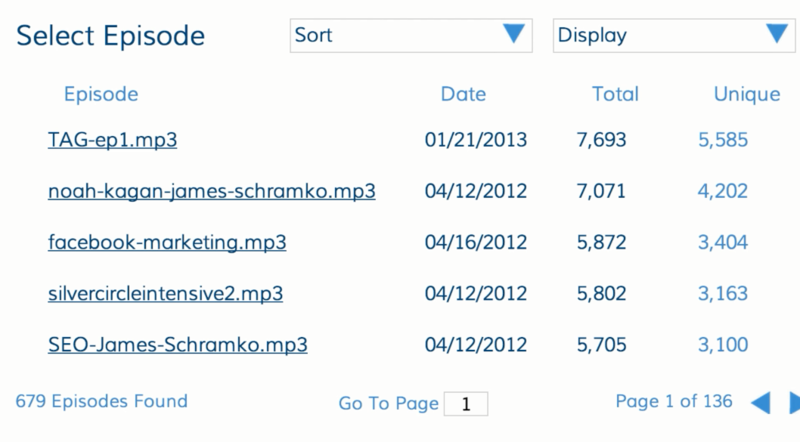 In fact, I’m fortunate enough to get up to four and a half thousand episode downloads in a single day these days. It’s quite common to get thousands, but I’m sure it won’t be long before I get a significantly higher volume, the way that my business is continuing to increase in volume. And I’m sure you’re seeing the same sort of things on SmartMarketer.com. Ezra: I do get quite a lot of views. I’m very happy about that. 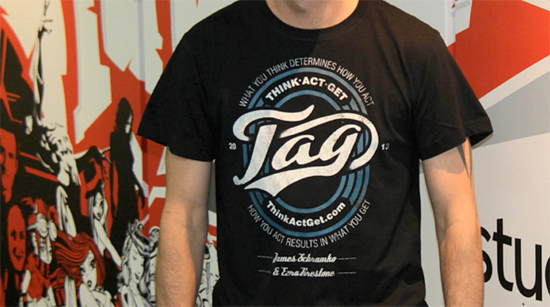 James: Cool. So, where are these things coming from? 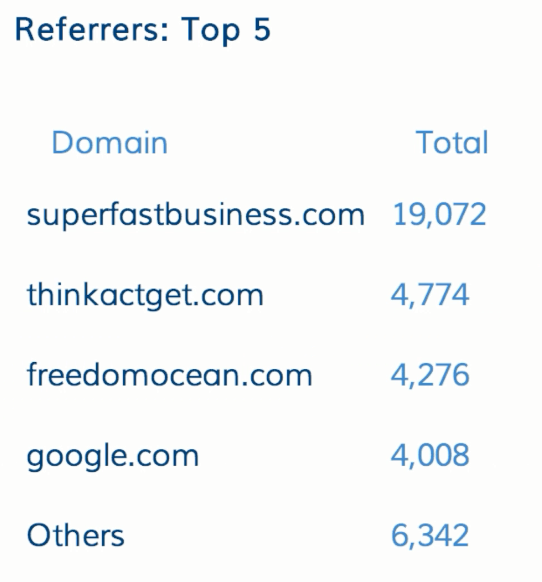 This screenshot is really interesting to me because although I’m not tracking SmartMarketer.com, I am tracking SuperFastBusiness, ThinkActGet and FreedomOcean, my top three podcasts now. SuperFastBusiness is an interesting one where I have long form interview podcasts, like we do on ThinkActGet and FreedomOcean, they might be 40 minutes, it might be two people. But then I also inter-splice that with three to five minute videos that we strip out the audio and turn into a podcast. But the overwhelming outcome here is that high volume, even if they’re short, is going to smash it for overall listenership. It’s literally five, four or five times more powerful having a higher frequency, and it doesn’t even matter if they’re not long episodes. Ezra: It’s good to know for podcasting, like the most popular podcasts that get the most listens, are the ones that are produced every day. We try to go for weekly on ThinkActGet. If you can get to weekly, that’s a pretty good frequency. Ezra: Well, I guarantee you we can get to 50 episodes in 2014. James: What we notice was when we had a slight lag, that our site visits and listenership dwindled a bit. And some people actually told us, “Hey, because you weren’t putting out episodes I had to go and find something else, and I found another podcast,” and you know, forget about ours. So we actually lose listeners if we don’t keep the frequency. And I found the opposite is true. With SuperFastBusiness, the more frequently I can put out episodes, the more chances I have. It’s like long line fishing. 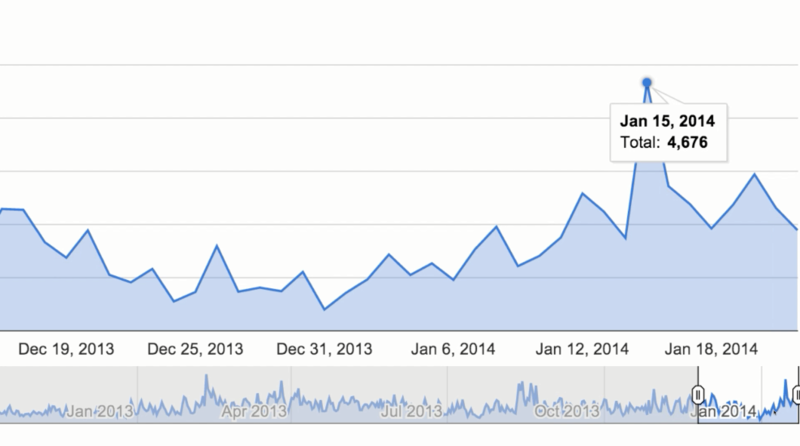 The more chances I have of people finding my podcast, and that’s why it’s significantly more powerful. In fact, I’ve now crossed a million downloads. When we presented, we were on the verge of it. We reached it that day, and it’s powering along. And I think we’ll get to two million much faster than we got the first million. 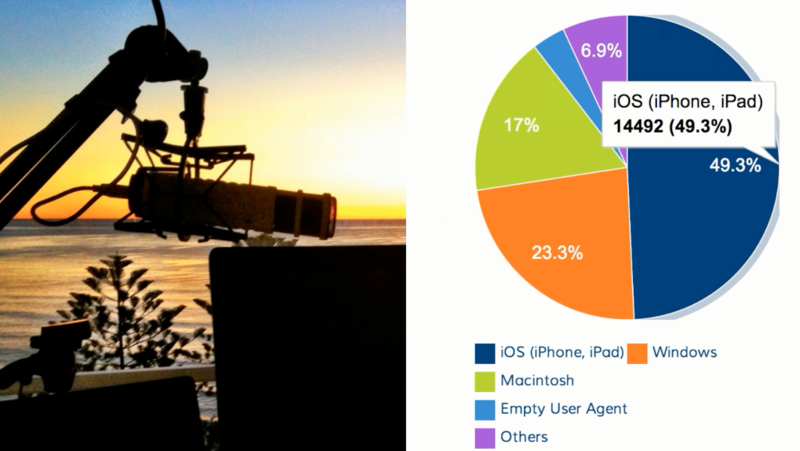 In terms of what devices people are using, half of them are iOS. iPhone, iPad. That’s a lot of Apple stuff going on there. And then there’s the Windows in the orange, and then the green is the Macintosh. Ezra: You know, if we look at what happened with podcasting, it got really popular when the iPod came out, right? And by the way, if you think about iPad, it just sounds like someone with a Midwestern accent saying “iPod.” iPad. 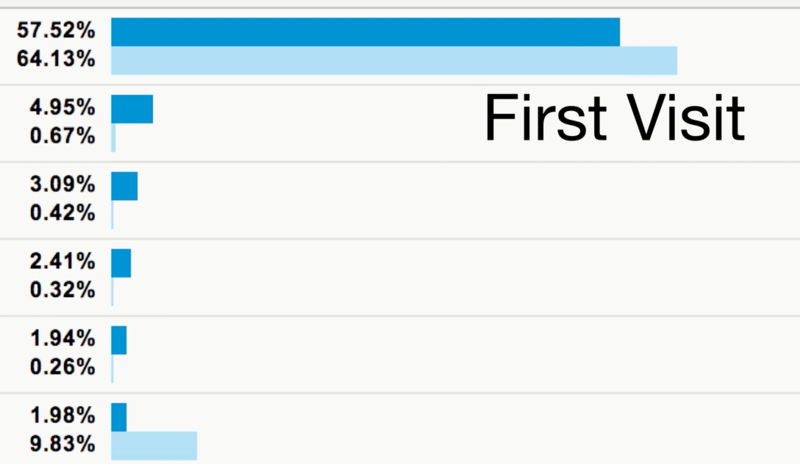 Anyways, the point is that… Yeah, I just wanted to throw that out there… That podcasting got really popular when the iPods came out. And then it got like significantly more popular in 2012 when the number of tablets in the United States, tablet owners doubled in a single month, doubled over Christmas. So basically everyone has one of these iOS devices, and they all have access to your content right there in their hand, and so there’s so much listenership. James: Yeah. Yeah, the iPad, really, is what’s tipped it over. And it’s the perfect device for reading and for listening to media. Ezra: I just gave mine away. James: You could be doing this anyway. You could be walking the dog, driving a car, on a plane…you don’t have to watch something, you can just listen, and it opens up the potential. At the gym, doing a workout, etc. The reality is, you can be your own superhero right now, you don’t have to go through the book publishing process, you don’t have to commit to rich media or video, even though I highly recommend it if you can. The audio medium is available for you. It’s simply a case of connecting up your website to iTunes using a plugin that guides you through every step of the way and you need so little to get started. You need to really, just flip on Record, with a good quality mic, which we’ll cover in a minute, and you’ll be able to get yourself a show. And suddenly you’ll develop all that power that comes with having a show. In fact, I got asked to speak in Thailand, to another popular podcast. Tropical MBA guys had an event there, and they built a whole community off their podcast and monetized it with a community, and their event, and they asked me to come and speak, so it really opens up opportunities. And of course, positioning yourself as an expert speaker or authority is just one of those glorious power authority things that happens when you’re a published author and it creates more of a following, it increases conversions, it helps you with your price points, it creates more opportunities. It’s like an opportunity machine. So the podcast is really how that came about, because these guys found me from Freedom Ocean. 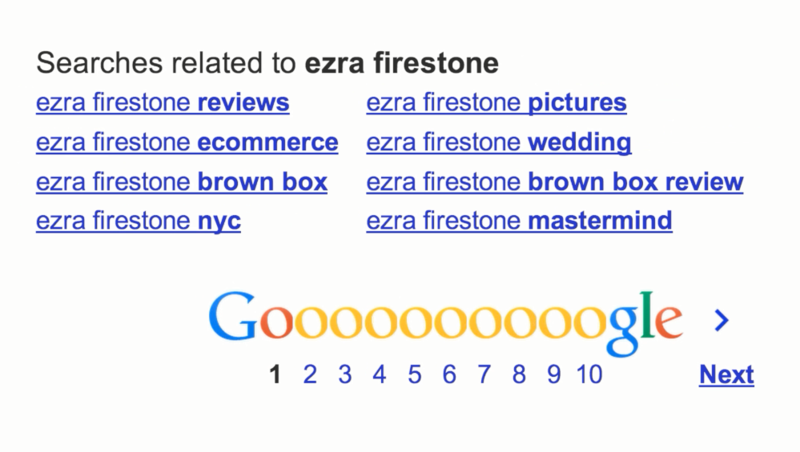 Now if you Google my name, or Ezra’s name, what you’ll find is that people are looking for the things that I actually sell. Products, websites, SEO. My product names, TrafficGrab. They want to see my Twitter. They want to find interviews. That’s exactly what I want. I want to control my own reputation. And the same for Ezra. They’re looking for his e-commerce, his Brown Box Formula. Ezra from New York City. His mastermind. James: I get it, it’s the ponytail, right? Ezra: I don’t know, man, I think that’s just the strangest thing ever. James: Maybe you’re just like a most hot bachelor, they want to see if you’re available. But you’re not. Beautiful wife. Ezra: I am off the market. James: OK, so, we even created some fans who started designing things for us and sending us in website skins, T-shirts and stuff. It’s that show feel. We’ve even had someone say that it reminds them of a craft beer label. 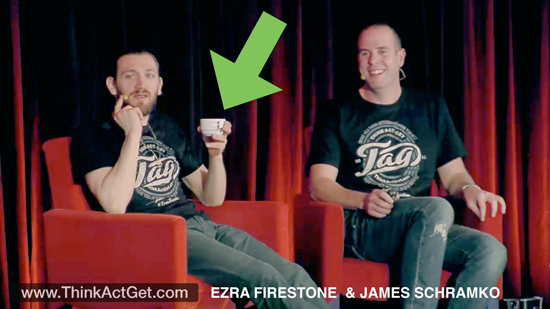 You know what craft beer is, Ezra? James: I know. But anyway, it creates its own little tribe. Ezra: It does. And people start… well, there you go. Ezra: And his nose, that’s pretty funny. But yeah, you end up with this like, such a… I’ve never seen a more engaged community. I’ve never been part of a more engaged community other than a forum community, right? It’s as engaged as a forum community, which is incredible, really, if you consider that people are just listening. Ezra: Fill me in on Crackle, here. James: I mean, I haven’t dived into that, you know, I couldn’t really care less about MBA or NHL. But my point is, it’s such a big platform. It’s right up there with all the big ones. And I noticed that, just in the Australian iTunes, in the iTV, the Apple TV, we’ve got Red Bull now, which is pretty cool. I just saw that yesterday. So we’re talking about what is the podcast. 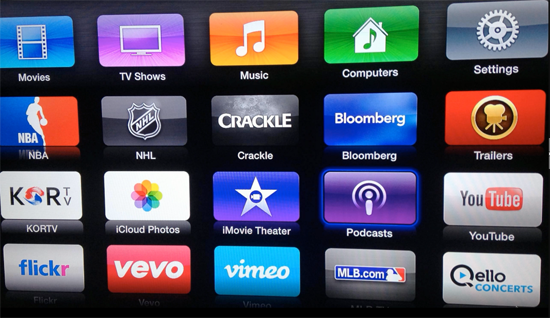 It’s basically Apple’s own platform, and you can choose a category. And you’ll find a category for your own show. 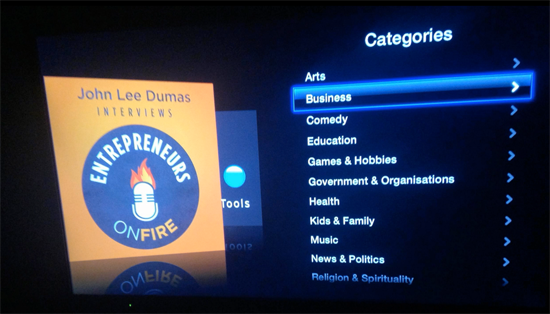 John Lee Dumas is in the Business category, he’s done really well in a short space of time. And he’s got a community of podcasters as well, and we’ve got a community of podcasters. 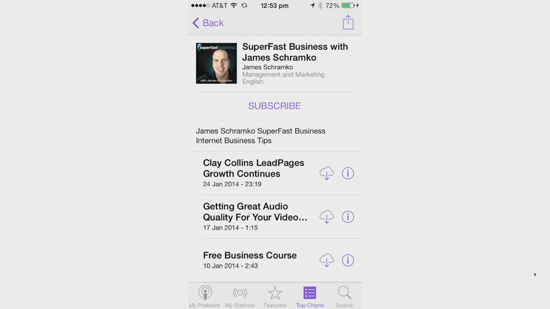 In SuperFastBusiness, our membership has a lot of podcasters as well. You probably want to know how you structure it. So there’s a few different structures. One I like to call the Robinson Crusoe. It’s where it’s just you, recording. You’re doing it by yourself, on your Pat Malone, alone, and that’s just turning on the mic and talking. And there’s quite a few podcasts like that. Probably not the easiest one, unless you’re very comfortable with yourself, and it is potentially, could be boring unless you’re extremely witty or something. If you take a slight twist and turn it into an Oprah format, that’s where you interview someone. 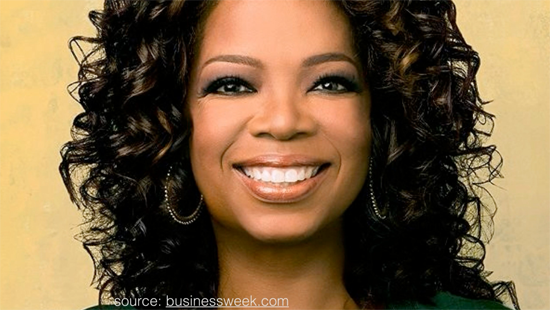 Oprah’s the interviewer and she pulls out the flavor from each of her guests, and that’s pretty much how you run Smart Marketer and I run SuperFastBusiness. I get guests on and I talk to them, and the other ones are just me, by myself. James/Ezra, thanks for doing this here as I missed this the first time at the live event you mentioned. You guys are great. This was a meat sandwich of good tips. My ears even made it in there. I feel like they need their own Twitter account. What would they tweet? I’m available for a guest appearance on your show. We can talk about the book Willpower and how people can use it to their advantage. Yes. I remember it was already covered in amazing detail on #1. Fair enough. Outstanding! The segment on asking questions is gold… unfortunately I’ve been guilty of asking these “boring” questions of my guests – including James! Yikes! Time to reboot my technique. Thanks for the kick in the pants. Dont be too hard on yourself. Be the representative for the audience and you will do well! 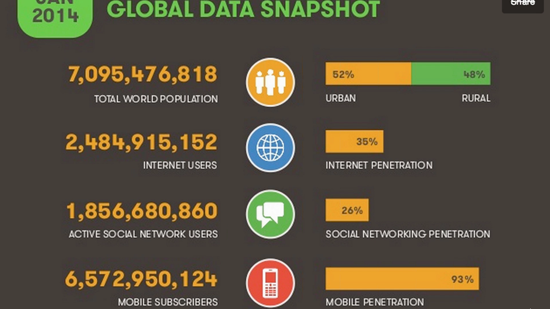 James/Ezra – Thanks so much for sharing this great info. I actually just launched a new podcast THIS WEEK and I have a follow-up question – if you could only focus on asking your listeners for an iTunes review or sharing the podcast through social media which one would you focus on? Thanks! I would probably ask for the share. Best episode so far. The part I was able to get the most out of was you overview of how to conduct the interview. i.e. get engaged, add value to your guests points, and ask the right questions. wow – this one is a monster! 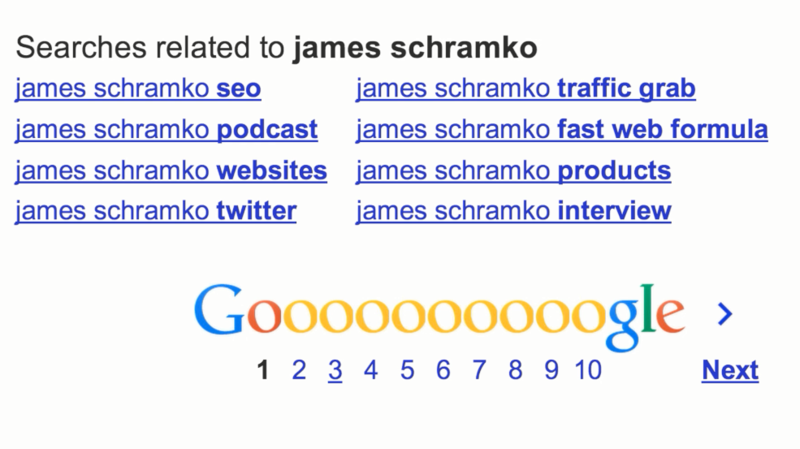 Thanks James – most valuable one for me to date as I am in the process of planning my own new podcast. The bit that hit a nerve was the boring questions bit – I am guilty of trying to lay the foundation too much by asking about the persons’ background story etc when I interview people. Everyone does it – and i am glad you have picked up on that. Dare to take the most interesting path! Amazing how 4 years on from this original post I search google for your advice on podcasting and get this episode and it filled in many blanks. Thanks James. I’m ready to launch. It is timeless! I am approaching 3Million downloads now! That’s incredible. Imagine buying those downloads with paid traffic. Yikes!!! I think one of the big things I learnt from you years ago was play the long game.